Denim Marketing is proud of its team’s participation in the Greater Atlanta Home Builders Association. Denim Marketing’s Senior Account Manager Courtney Rogers is in her second year serving as Chair of the Young Professionals Group (YP). This council seeks to encourage young leaders to get involved and continue the proud tradition of industry involvement into the future. 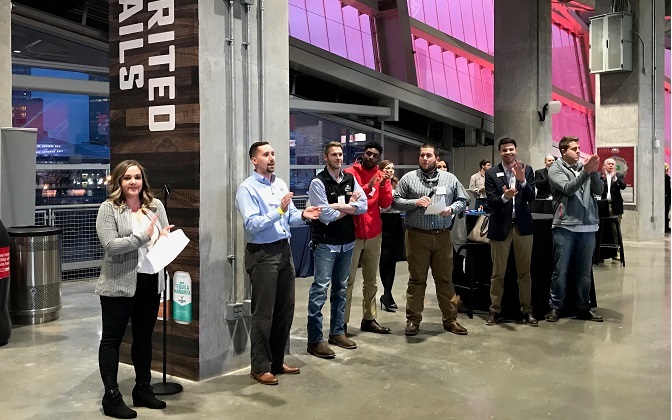 The group’s goal is to energize the under 40 workforce by offering a fun platform to connect with one another and potential mentors to expand members’ professional networks. Courtney Rogers served as committee chair of the Elevate Committee (a committee of PWB Atlanta) for two years before YP became its own group within the HBA. We asked her several questions about her experience with YP and its plans for the year. Q: What are your goals this year for YP? A: Since it’s only our second year as YP, our main goals are to continue growing awareness about the group within the HBA, and to create a more organized, efficient group. We’ve created individual committees and tasked each committee with unique responsibilities to give everyone something to be responsible for and spread the work out evenly among the group, which is allowing us to do more while being more effective! Q: What are you excited about? A: I’m excited about the continued growth of YP and seeing the excitement other people have for this group. I’m also really excited about the program our education committee has launched aimed at getting builders and their trade partners in front of high school students to educate them about trade careers and connect them with people that can offer jobs or job training immediately after graduation. I think the Careers Connection program that Tony Cann, Gino Fabrizio and Myles Chatham have started can make great strides toward assisting the trade industries that are experiencing major skilled worker shortages by encouraging more high school students to look at a career in trades. Q: What can people reading this blog help you with? A: One of the biggest things we need right now are builders and trade workers who are interested in speaking to local high school students about careers in trades. We’d also love to hear from teachers who have applicable programs in their schools that would be interested in having speakers come in to connect with their students. We also need continued support through attendance at our events, as well as sponsorship so we can continue to grow and be effective at getting young professionals in the building industry involved in the HBA. Q: Why did you decide to run for this position/ volunteer for this position? A: I entered the industry shortly after the recession ended and it was very obvious that there was a gap between the young professionals just entering the industry and those who’d survived the downturn. There was essentially a generation mission from the workforce in our industry because for so long, no one had been really making new hires. It seemed like there was a disconnect between the young professionals and the rest of the industry, which made it hard to figure out how to become involved and where we fit in. When I learned about Elevate, the original young professionals-focused organization within the HBA, I knew I wanted to be involved in helping other YP’s find their place within the HBA and within the industry. Q: What else do you want us to know? Our next event is coming up! Mark your calendars for our Sip & Shop event at Kendra Scott Perimeter Mall benefiting HomeAid Atlanta! The event is Wednesday, May 1 from 5-8 p.m. at the Perimeter Mall Kendra Scott store. During the event, 20% of the proceeds will go directly to HomeAid Atlanta. If you can’t make it, you can call in a phone order direct to the store that day, and 20% of your purchase will still go to HomeAid! For more information on how you can get involved with YP, visit the Atlanta HBA online. For more information on Courtney, see our team bios on this site.